Cheerleading does require a lot of athletic ability. We work cardio and run all the time, we lift weights and do other things to strengthen ourselves. Stunting is the main thing that makes cheerleading a sport. Stunting is very difficult and it takes a lot of hard work to get it right, otherwise someone can get really hurt, even die, which would not be very good. Cheerleaders also compete. There are regional and national competitions all over the world. 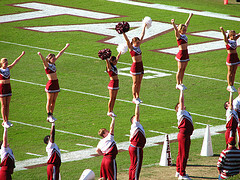 Many people all over consider cheerleading a sport, while others don’t. The debate will probably continue on for a long time, and will never officially be resolved.